Reservoir Dogs location: discussing Madonna lyrics: Pat and Lorraine’s, Eagle Rock Boulevard, Eagle Rock, Los Angeles. It seems unbelievable that the Reservoir Dogs warehouse was torn down, but I guess no one realised the significance at the time. Just imagine the tourist bucks, $5 entrance, Stealers Wheel CDs, souvenir rubber ears…. missed opportunity or what? Well you can still worship at the site (it’s now – inevitably for Los Angeles – a parking lot) or check out the alleyways of the bloody shootout after the robbery. Reservoir Dogs location: to tip or not to tip: Pat and Lorraine’s, Eagle Rock Boulevard, Eagle Rock, Los Angeles. The best Dogs experience is breakfast at Pat and Lorraine’s, 4720 Eagle Rock Boulevard, Eagle Rock, northeast of downtown Los Angeles, which is where the Dogs gather to discuss Madonna lyrics and the ethics of tipping. The staff are extremely friendly, so ignore mean old Mr Pink and leave a tip. 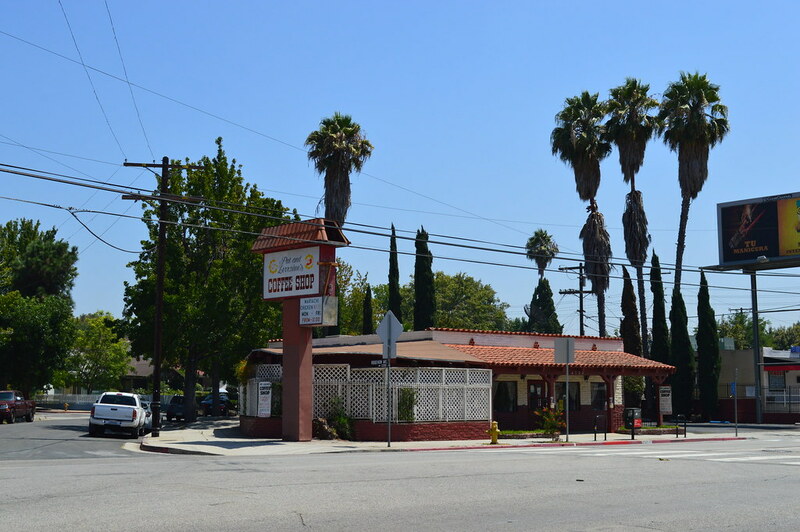 Reservoir Dogs location: the robbery at ‘Karina’s’: West Burbank Avenue in Burbank, San Fernando Valley. The robbery itself was filmed up in the San Fernando Valley. The forbidding brick ‘jewellery store’ – ‘Karina’s’ (named after Jean-Luc Godard’s muse, and one-time wife, Anna Karina), is a mirror/picture frame supplier at 2612 West Burbank Boulevard at Wyoming Avenue in Burbank. The aftermath, though, is filmed way to the northeast of Downtown LA in the Highland Park district. More movie references abound – Mr Blue is “Dead as Dillinger” and Laurence Tierney (gangleader Joe Cabot) played Dillinger in 1945 for Monogram Pictures, the company to whom Jean-Luc Godard dedicated A Bout de Souffle. Reservoir Dogs location: Mr Orange gets the bloody wound: Marmion Way, Highland Park, Los Angeles. Mr Brown (Tarantino himself) gets shot, while Mr White kills the cops, in the alleyway between Avenue 55 and Avenue 56 here. Mr Orange (Tim Roth) receives his bloody gunshot wound by 5518 Marmion Way, near Avenue 56. Reservoir Dogs location: Mr Pink gets hit by the car: Avenue 50 at York Boulevard, Highland Park, Los Angeles. Mr Pink (Steve Buscemi) shoots his way out and heads down Figueroa Street (play Spot-the-camera crew in the shop windows in this scene), south of, and parallel to, Marmion Way. He gets hit by a car at the corner of York Boulevard and Avenue 50, alongside what is now Cafe de Leche, commandeers the motor and makes off along Avenue 50. Reservoir Dogs location: Mr Orange meets up with his superior: Johnie’s, Wilshire Boulevard, midtown Los Angeles. The café, where Mr Orange meets up with his superior, is Johnie’s Coffee Shop, 6101 Wilshire Boulevard at Fairfax Avenue (a familiar location – it’s where Anthony Edwards receives news of impending apocalypse in Miracle Mile, Eds Norton and Furlong stop off in American History X and where the Dude discusses the severed toe with friend Walter in The Big Lebowski. It’s now closed, though still occasionally used for filming. The graffiti-covered walls, where Orange rehearses his druggy cover story, could – until 2006 – be seen at the junction of Beverly Boulevard and Second Street and Toluca Street, just northwest of downtown, but no more. The location was a platform on LA’s original metro train line, dating from the early 1900s, which ran through a tunnel under the hill to the south. A huge apartment complex called Belmont Station has been built on the site – into which a section of the Belmont Tunnel/Toluca Substation has been integrated. Reservoir Dogs location: Mr Orange rehearses: Beverly Boulevard at Second Street, downtown Los Angeles; now the site of the Belmont Station apartment complex. He retails the story to the other Dogs in The Lodge, 4923 Lankershim Boulevard (tel: 818.769.7722) between Vineland and Magnolia, which is in reality a North Hollywood gay bar, and flashbacks to the toilets of the Park Plaza Hotel, 607 South Park View Street, midtown Los Angeles. “The hotel has been featured many times in films,” claimed Tarantino, “but I’m the only director that has used only its bathroom.”. Maybe, but it’s a close thing. The Park Plaza supplied the men’s room at ‘Capitol Pictures’ for the Coens’ Barton Fink, but it was also used for the USO dance scene. One of the most popular locations in Los Angeles, the Park Plaza has been given a major makeover but no loner functions as a hotel. This popular film location can also be seen in Martin Scorsese’s New York, New York, Steven Spielberg’s Hook, Richard Attenborough’s biopic Chaplin, with Robert Downey Jr, and Christopher Nolan’s The Prestige among many others. Reservoir Dogs location: site of the Dogs’ warehouse: Avenue 59 at Figueroa Street, Highland Park, Los Angeles. The Dogs’ warehouse has sadly been demolished, but you’re sure to recognise the site, now a car park, on 59th Avenue, just south of Figueroa Street in Highland Park. Fittingly, the building (which was also used for Mr Orange’s scuzzy hotel room) was a former mortuary.